We are slowly but steadily inching closer to the Heartland season 11 finale. 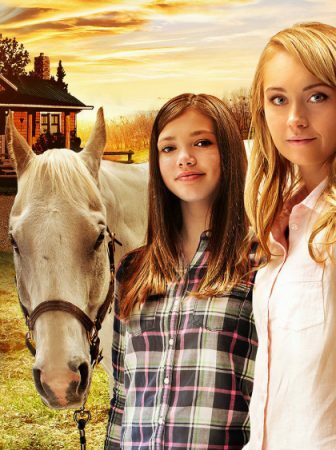 But before we get there we still have two beautiful Heartland episodes to check out. One of which aired this past Sunday. 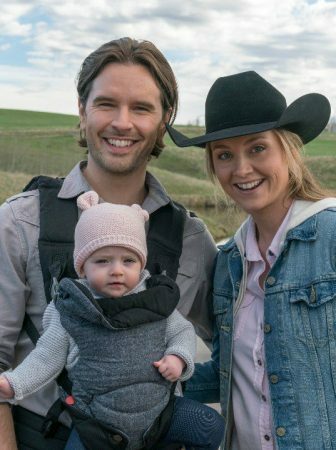 So without further ado, let’s just jump into the recap for Heartland season 11 episode 16. 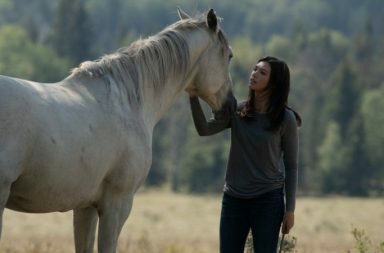 If in the last few episodes we saw Amy working with client horses again, then Heartland season 11 episode 16 brought us a bit different horse storyline. Because on this episode Amy focused on Heartland’s own Phoenix and his recovery. 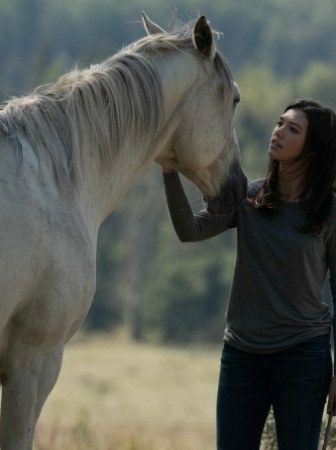 At the start of this episode, we saw Peyton (whose horse Amy helped in the last episode) drop by and thank Amy for all she did for her and Tyson. And since Georgie was there too, Peyton invited her to come train at Westfield for the day. To which, Georgie, of course, agreed, since it was getting pretty cold outside. But while there Georgie had a run-in with Dylan, which, prompted her to try jumping over jumps that were way too high for Phoenix. 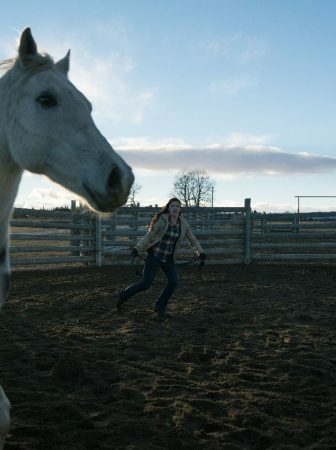 Although Georgie herself got thrown from Phoenix as well, the horse was the one who walked away with an injury. Because after unsuccessfully trying to jump over a really high jump, Phoenix sprained his leg. And, since even Scott couldn’t say how serious the sprain was, it sent Georgie into a tailspin. She blamed herself for what happened and even spent all night with Phoenix tending to him. Surprisingly in the company of Dylan who came to check on her and Phoenix. And luckily, in the end, icing Phoenix’s leg worked because Scott determined that Phoenix will make a full recovery. However, even that didn’t fully remove the guilt that Georgie was feeling for getting Phoenix hurt in the first place. Especially after a video of her fall made the rounds on the internet. So I have to wonder where Georgie’s story arc will end up by the end of the season in two-episode time. Because, lately, the Heartland writers have been putting her through a real emotional rollercoaster. While Georgie was dealing with all that, Lisa had her own set of problems to solve. At the beginning portion of the episode, we saw Lisa determined to make wreaths for her employees since this year she couldn’t pay them the annual Holiday bonuses. But as it turned out, Lisa used that to put off a bigger problem she had. She was getting audited, for which she had to go through all her finances and receipts. And that wasn’t even Lisa’s only hardship to overcome on Heartland season 11 episode 16. Since both wreath-making and going over your finance require a lot of space, Lisa also asked for her own workspace in the house. And, although Jack told his wife to just set up in one of the rooms, Amy wasn’t too happy when she saw that Lisa had taken over her old bedroom. So the two walked away from the conversation a little bit upset. Fortunately, after a night of sleep and mulling things over, both women came together the next day and apologized to the other. Amy let Lisa know that she overreacted and that Lisa could use her old room as her make-shift office and wreath-making station. While Lisa said that she was sorry for overstepping. And at the end of the episode, Amy and Jack even surprised Lisa by taking upon themselves to make the wreaths, so Lisa could focus on the financial stuff. Which was a heartfelt touch to the whole storyline. 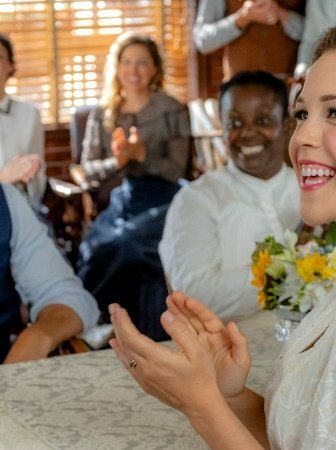 So hopefully, this storyline will end Lisa’s arc about her not quite being a full-fledged member of the Heartland family. 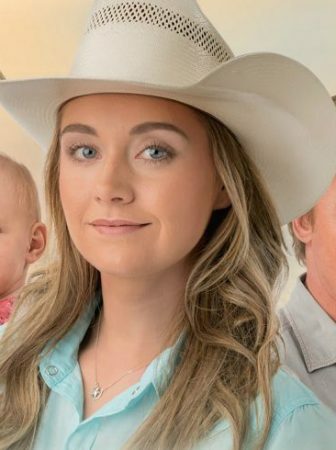 Because it’s about time we saw Lisa as a true resident of Heartland and a part of the Bartlett clan. 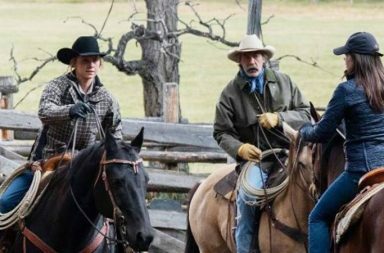 The last bigger storyline of Heartland season 11 episode 16 went to Jack and Mitch. In episode 13 we saw Jack, Tim and Mitch finalize the deal of them all co-owning Jack and Tim’s cattle business. And, while it was a huge stepping stone for Mitch, on this episode we saw him struggle with other, non-carrier parts of his life. The episode began with Jack telling Mitch that thanks to Tim he had to look after friend’s cattle for a few days. So Mitch decided to tag along. While there, they discovered a new-born calf who looked being close to hypothermia. And seeing that the little one couldn’t even stand, the two men decided to bring the calf to a cabin close by, warm him up and get him to eat. But while that was a task in itself. In addition to trying to get the calf to eat Jack also managed to get Mitch to open up about what was on his mind. And as it turned out, Mitch was doubting himself because despite having his share in the cattle business he didn’t have more of his life figured out. And thankfully for Mitch, Jack had some sage advice. Jack advised Mitch, that although it is good to keep in mind that life is short, it is also good to remember that life is lived one day at a time. And then later proceeded to tell Mitch to not give up on Lou if he thinks that there still is a chance for them to be together. So by the end of the episode, Jack and Mitch managed to not only nurse a calf back to health. But also have an important conversation that might just end up bringing Mitch and Lou back together. One of the smaller storylines of this episode was Jack gifting Amy a piece of his land for her and Ty to eventually build their house on. And it was truly a beautiful moment between a grandfather and a granddaughter. However, what I loved even more about this little nugget of a storyline was the fact that they did dare to show Amy’s not so positive of a reaction to it. Because Amy felt like she is being pushed away, what with Lisa taking over her old bedroom and Jack suddenly giving her a piece of land that is quite far away from the ranch house. Of course, Jack managed to convince Amy that that was definitely not his intention. But I am glad that they decided to play it out that way. Because it only emphasized how close this family truly is. And how much family and being close to family means to Amy. 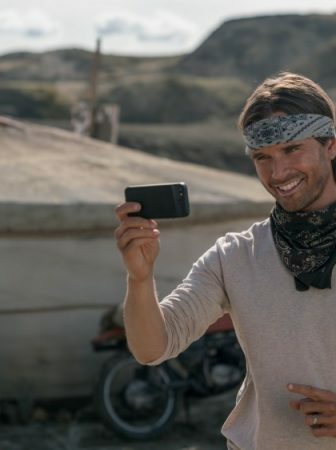 And there you have it, the recap for Heartland season 11’s antepenultimate episode. 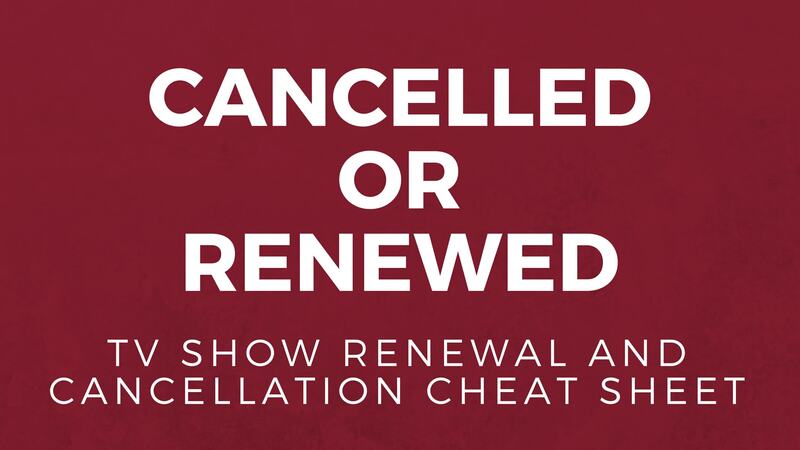 Don’t forget to tune NEXT Sunday, April 1st, for the second to last episode of the season. And let me know what you thought of this one in the comments below! I am disappointed because Ty hasn’t been on episodes 15 and 16. Where is he? Don't you worry, Elisha! He's going to be back for both episode 17 and 18. I’ve loved this watched everyday and now there’s no more I’m sad. Please will there be more coming ??? Love this show the people the animals the storyline make me want to leave New Zealand and go visit this beautiful place. Time to let Heartland go. Last 2 seasons nothing like the earlier ones. Seems to be dragging. I disagree, Marsha. I really liked the last 2 seasons. But to each their own. Actually Jack gives Lou a different piece of land for Georgie and Katie when they are older. 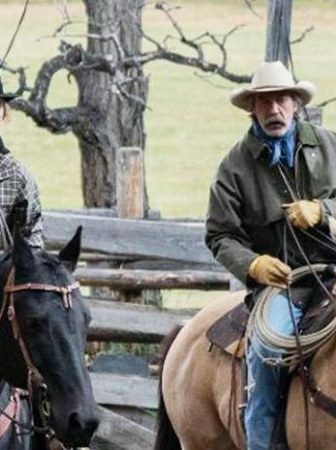 He already gave Lou land for the dude ranch. You're right, Terry. Jack gave Lou a different piece of land. Sorry for the confusion. I watched the episode,thought it was great as most of them are. I agree! It was true Heartland episode!